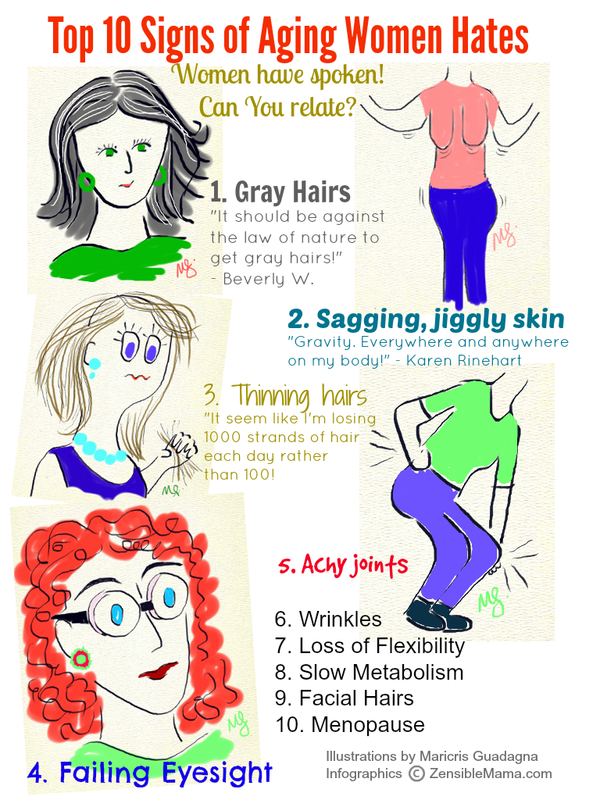 After doing my rather funny impromptu video about why I hate gray hairs, I was inspired to survey real women about aging and what they hate about it! Their responses were phenomenally unanimous! And they told it like they felt it! So here's the not-so-hot deal on aging according to you! "I think sagging skin coz it's very easy to color your hair again and there are lots of products that can prevent wrinkles. but its very expensive to get botox hahaha." - Ellen Garcia. I know all of us will go down this [aging] path but it doesn't mean we can't hate it. Personally, if I can stop it, I will - but then again, even the great technology we have, is incapable of reversing the process! Thus, we're told many times, like broken records to "embrace it" and to "age gracefully". Not really sure how I can do that since there is really nothing graceful about getting old - except perhaps continue coloring my gray hair and pretend I don't have them! Note: All comments here are from real women and their honest opinions - quoted as they've said it. Huge thanks to all the ladies who contributed to make this Infographics possible! Were you able to relate? Then go ahead and share it!